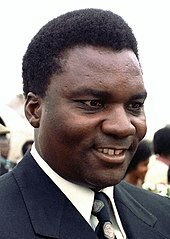 The 1973 Rwandan coup d'état, also known as the Coup d'état of 5 July (French: Coup d'état du 5 Juillet), was a military coup staged by Juvénal Habyarimana against incumbent president Grégoire Kayibanda in the Republic of Rwanda. The coup took place on 5 July 1973 and was considered by many as a betrayal. While still under Belgian rule in the 1950s and early 1960s, resentment towards colonial rule and the ethnic Tutsi elite among the Hutu had increased, and led to the formation of the political party Parmehutu by Grégoire Kayibanda in 1957, with aims to overthrow the monarchy and gain identical rights ("emancipation") for the Hutus. This was achieved following the 1961 election and referendum, but the absence of effective Tutsi opposition led to regional tensions between Hutu politicians. The central and southern politicians were opposed by those from the north. In the months prior to Habyarimana's coup, the army (mainly composed by northern soldiers) had intensified persecution of ethnic Tutsi through the formation of Hutu vigilante committees to ensure enforcement of the required ethnic quotas requested by Habyarimana. Kayibanda refused this policy of quotas and was then described by the army as a 'weak' leader. Fake rumors and documents were produced by the army against the President and Rwanda became isolated economically and diplomatically, especially from neighbouring Uganda which housed large numbers of Tutsi. This situation was regarded by the majority of the population as a betrayal from Habyarimana. Indeed, prior to the coup Habyarimana, who served as General and Head of the Rwandan army, was also a friend of president Kayibanda. Immediately after seizing power Habyarimana outlawed all political parties but in 1974 created his own, the Mouvement Révolutionnaire National pour le Développement (MRND). While the coup itself was bloodless, fifty-six people – mostly former leaders – were killed by the security services between 1974 and 1977, with Kayibanda dying in detention in 1976, probably of starvation. ^ a b Prunier 1998, p. 61. ^ Prunier 1998, p. 75; 60. ^ Prunier 1998, p. 76. ^ "Mission d'information sur le Rwanda" (in French). Celui-ci s’était construit sur la destruction de la Première République. Entre 1974 et 1977, 56 personnes, pour la plupart d’anciens dirigeants de la Première République, avaient été assassinés par les services de la sécurité. Le premier Président rwandais, Grégoire Kayibanda, était mort en détention en 1976, probablement de faim.